47 - Αναστάσ Καρύδης - 30 - Παναγιώτης - φραγκοράπτ. 47 - Anastas Karydis - 30 - Panagiotis - franco stitcher ? 70 - Geor Sakelarakos - 59 - _____ - ???? 90 - Geor Karytinos - 47 - _____ - ???? 100 - Geor Kotzonis - 20 - Ioannis - ???? 123 - Dim Lambropoulos - 47 - _____ - ???? 125 - Dim Koukouzis - 47 - _____ - some occupation to do with footwear? 128 - Dim Vindiris - 28 - _____ - franco stitcher ? 129 - Dim Kotzonis - 31 - _____ - some occupation to do with footwear? 136 - Dim Kioses - 67 - Ioannis - ???? 139 - Dim Bouklizas - 23 - Nikolaos - ???? 140 - Dim Vounaniotis - 30 - Georgios - ???? 141 - Δημ Πουλάκος - 46 - _____ - οικοκ υπάλλ ??? 141 - Dim Poulakos - 46 - _____ - ???? 147 - Δημ Παναγουλέας - 57 - Παναγιώτης - καντιλαναύτ. 147 - Dim Panagouleas - 57 - Panagiotis - ??? 149 - Dimosth Karydis - 24 - Panagiotis - ???? 150 - Emmanouil Doxas - 38 - Emmanouil - ???? 151 - Emm Kaisarios - 38 - _____ - ???? 156 - Efthym Filipopoulos - 41 - _____ - ???? 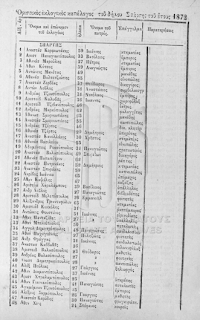 173 - Ioaklis Tzakiris - 30 - Ioannis - ???? 178 - Ilias Laskaris - 27 - Panagiotis - ???? 179 - Ilias Kotzanis - 23 - Georgios - ???? 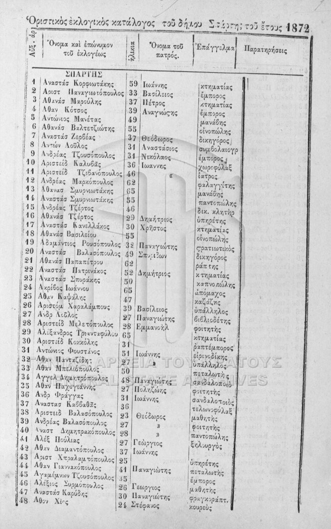 185 - Theodoros Fengaras - 65 - Konstandinos - ???? 187 - Θεοδ Σκ πης - 62 - _____ - κλητ της γομ ? 187 - Theod Sk???? - 62 - _____ - ???? 206 - Ioan Aristovoulos - 28 - Theodoros - some occupation to do with footwear?